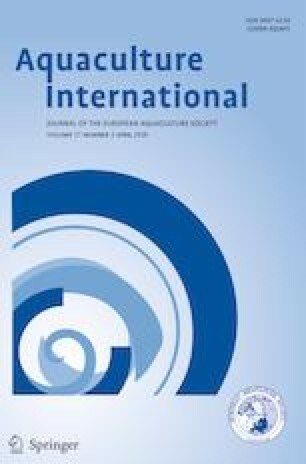 The effects of three concentrations (0.5, 1.0 and 2%) of rosemary extract “Inolens 4” and control (without additive) on microbiological quality, sensory attributes, colour parameters and oxidative stability of rainbow trout (Oncorhynchus mykiss) fillets during refrigerated storage after different periods (0, 3, 6, 10 and 14 days) were investigated. Microbial communities grew to between 1.93 and 2.29 colony-forming units per gramme (log CFU g−1), 5.10 and 5.27, 5.12 and 5.80 and 6.34 and 7.66 log CFU g−1 after 0, 6, 8 and 10 days of storage, respectively, and fillets treated with Inolens 0.5 showed the lowest total viable counts among all analysed groups. Also, sensory analyses showed that Inolens 0.5 achieved best scores in all sensory attributes of cooked flesh. Evaluation of lipid oxidation parameters proved that treatment with Inolens 4 had a positive effect, leading to delay oxidation processes in flesh. Special thanks belong to the technicians Kateřina Fulínová and Vítězslav Plička, from the Laboratory of nutrition of IAPW, FFPW, USB, České Budějovice, for their kind help during the analyses. The study was financially supported by the Ministry of Education, Youth and Sports of the Czech Republic-the CENAKVA project (LM2018099), CENAKVA Center Development (CZ.1.05/2.1.00/19.0380) and Biodiversity (CZ.02.1.01/0.0/0.0/16_025/0007370), by the Ministry of Agriculture of the Czech Republic (No. QJ1510119 and No. QJ1610324).